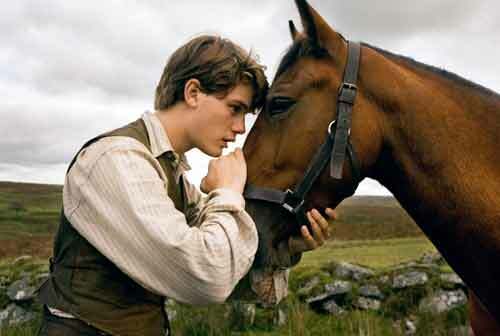 Steven Spielberg’s (Jurassic Park) adaptation of Michael Morpurgo ‘s novel , War Horse is a heart-strings tugger that earned six Academy Award nominations. Rated PG-13, the film tells the story of an amazing horse and his young trainer Albert (newcomer Jeremy Irvine, TV’s Life Bites) throughout World War I. After his horse is bought to serve in the British Army, Albert enlists and both must face the horrors of war while touching the lives of others. The drama movie also stars Emily Watson (Red Dragon), David Thewlis (Harry Potter and the Deathly Hallows Part 2), Benedict Cumberbatch (Tinker Tailor Soldier Spy), Toby Kebbell (The Sorcerer’s Apprentice) and Eddie Marsan (The Disappearance of Alice Creed). War Horse was nominated for Best Original Score, Best Art Direction, Best Sound Editing, Best Sound Mixing and the biggie, Best Picture. The film grossed a tidy $78 million, with much approval from critics and audiences.